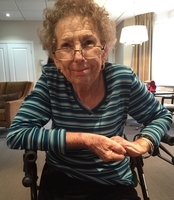 After a brief stay in hospital, Ann passed away peacefully on Wednesday March 20, 2019 at the Humber River Hospital. She was the loving wife of the late Douglas William Maclean who predeceased Ann on October 15, 2008. Much loved Grandmother of Courtenay, Liam and Emilee. Ann and Douglas were longtime residents of Weston. She was retired from secretarial work with the Toronto School Board. Ann will be fondly remembered by her many friends, neighbours and past colleagues as well as church members from Central United where she was involved for many years. Family and friends are invited to a Celebration of Ann's life on Saturday March 23rd at Central United Church, 1 King Street Weston from 1pm until time of service at 2pm. Consider providing a gift of comfort for the family of Anna Maclean by sending flowers.